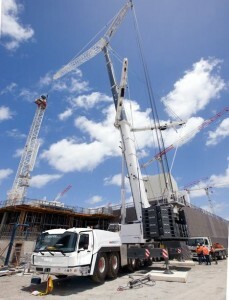 South Australia based Fleurieu Cranes has taken delivery of the first Grove GMK6400 to arrive in Australia. The company had originally intended to purchase a luffing jib for its existing 350 tonne Terex AC350/6 All Terrain crane, but after seeing the capabilities of the 400 tonne Grove GMK6400, the company’s management decided to add one to its fleet along with its full 79 metre luffing jib. Fleurieu, which is based in the Adelaide suburb of Wingfield, purchased the GMK6400 through local Manitowoc dealer RMB Service Group. The crane joins three other Grove All Terrains in the company’s fleet – two 55 tonne Grove GMK3055 units and a 100 tonne GMK4100. The new GMK6400 travels in a trailing boom configuration, with a with a three axle boom trailer. On arrival the GMK6400 went straight to work at the new Royal Adelaide Hospital, dismantling a tower crane belonging to Select Plant. The GMK6400, configured with 44.8 metres of its 60 metre main boom plus 43 metres of luffing jib and 115 tonnes of counterweight, managed all the lifts comfortably, including the removal of the 13.7 tonne top section of the tower crane with the jib luffed to 80 degrees working at a radius of 46 metres.